On the pattern writing, and 10kH front (or the front without changing pictures), last Friday a friend and I did a 2 hour long, 10 piece photo shoot. Outside, in the middle of the afternoon, in the middle of August. That was an experience I hope never to repeat (though I probably will), but we had been trying to schedule this all summer, so I wasn’t going to let a little heat get in the way. 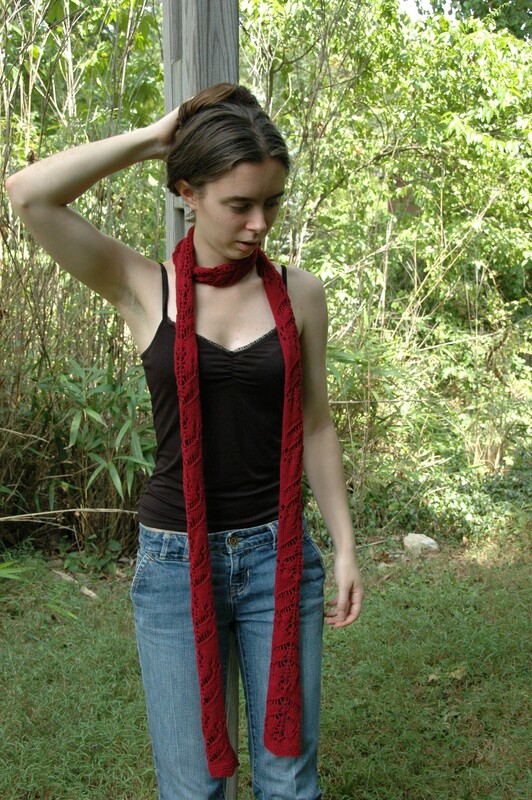 Next in the pipelines pattern wise is lining up test knitters for the Dancing Girls Scarf. I’ve got two test knitters, and am still looking for a third. I’m hoping to have the Dancing Girls scarf done and out to testers today or tomorrow. Once I’ve gotten okays from all of my test knitters for A Study in Grey and the blankie, I’ll proof the patterns, get photos of the blankie, and publish the patterns, hopefully by the end of the month. The pattern release for Dancing Girls will probably follow a week or two behind Study in Grey and SiG, because I’m only going to ask my testers to knit a handful of repeats before I release the pattern. I’m finding that there are some days that I do nothing, or close to nothing, but then there will be a string of days when I’ll work for 5, sometimes 6 hours, towards my modified 10kH. It feels like there are getting to be fewer and fewer days where I’m working for an hour or so, and more days when I’m putting in at least 2 or 3 hours. I’m thinking that this might be because I’ve started including more of a variety of activities as counting towards the 10kH. Looking back on my first post originally the goal of the 10kH was (ignoring the art part, which has since dropped off the face of the earth), to “work on knitwear design paperwork for one hour everyday” I’ve decided revising this statement to “work on knitwear design for at least an average of one hour everyday” would be more accurate, and productive goal. Yay productivity!!! And so ends a very long update, in two parts. Hi Holly – I can’t find your email address but I’ve finished the scarf and commented on the thread!! Thanks for letting me know. I emailed you a few minutes ago.